Ever smiled or noticed yourself in the mirror and seen a flash of silver in your teeth? 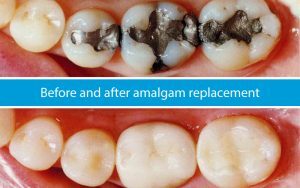 Amalgam replacement may be an option for you. That silver is ‘amalgam’ – a filling material that was very popular in the 20th century for its strength and durability. There are some shortcomings with amalgam fillings – the main two being their appearance and the fact that over time they can place uneven pressure on your teeth – causing them to crack. Some people also voice concerns over the mercury content of their silver fillings as the reason for wanting amalgam replacement. These days thankfully, we have new composite filling materials that are white and strong. The new nano-composite materials are very advanced and allow for incredible blending and matching of the filling material with your natural tooth structure. The process to remove the old silver fillings (amalgam replacement) is as simple as having a normal filling done. At Fraser Dental, we are experts in amalgam replacement and have years of experience with this procedure. The first step is to have a consultation with either Geoff, Milan, Becky, or Alex or just discuss it with them at your next annual check-up. The procedure is very cost-effective, and the results on your smile are dramatic!